Hi Tampa Bay, Alex here to let all of you know about the great deals happening at The Columbia Restaurant for “1905 Day”. On Sunday, September 18, The Columbia Restaurant will be rolling back the prices for “1905 Day” to celebrate the106th Anniversary of the fourth and fifth generation family-owned business. As has been the tradition since their 75th Anniversary, the Columbia has developed a special menu with the prices of yesteryear for this day. 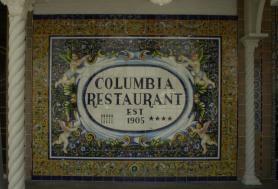 From noon until 7:00 p.m. on “1905” Day, guests will enjoy the Columbia Restaurant’s world-famous Spanish cuisine for the prices they might have paid in the “good ole days”. Menu items will include: Chicken & Yellow Rice “Ybor” for $2.95, Boliche (eye round of beef) for $2.95, Merluza “A la Rusa” for $2.95, Columbia’s Original “1905 Salad” for $1.95, Sangria for $.95 cents, flan for $.50 cents, and their richly brewed American coffee for $.05 cents. This is a great deal on delicious food! * The Columbia Café on the Riverwalk at the Tampa Bay History Center in Downtown Tampa will not offer the "1905 Day" menu, but will be open and serving from their regular menu. Tell all your friends and family about “1905 Day” at The Columbia Restaurant. It is going to be a great time for everyone. Check back with us often for more information on Dining in Tampa Bay and Things To Do in Tampa Bay!